Recruitment is undoubtedly a challenge in the hospitality industry – how to stand out from the competition and attract great talent, and now we have Brexit too causing significant uncertainty about our future resource pool. UK Hospitality recently warned that there could be 200,000 fewer young people in the UK in the next 10 years – critical for an industry where between 60 and 70% of the workforce is under the age of 25. 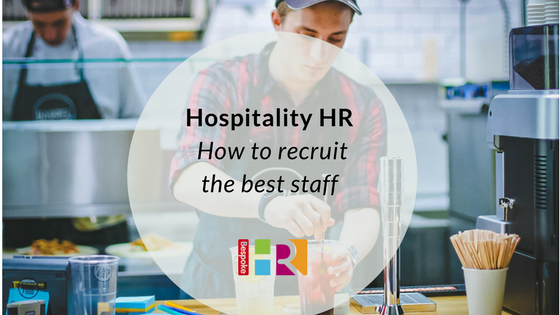 With twenty-six thousand start-ups in the hospitality industry last year alone, recruiting and retaining the best people for your hospitality business is now more important than ever. One company we spoke to told us that after the Brexit announcement, the pool of candidates “literally dried up overnight.” They went from endlessly sifting through numerous CVs dropped into their shops speculatively to getting nothing. Running constant advertising is expensive, time-consuming and sometimes ineffective. So how do you attract high quality candidates in a dwindling pool of applicants? The recruitment approach you need will depend on several factors including the budget and time resources, the type of staff (skills and experience) needed, size and location. It is so important to produce a great job description and well-crafted recruitment advert. Hospitalitynet maintains that a thorough job description enables you to state exactly what you expect from candidates before the job has even started, and it’s even better when accompanied by “A day in the life of …” published on your website to give a unique view of what it is like to work for you in that role. Social media is the number one choice for marketing in the hospitality industry generally (despite recent controversial news of a major hospitality organisation moving away entirely from the use of social media). When it comes to recruitment, depending on the level of role, LinkedIn and Twitter could be the most obvious. However, think about using other buying and selling type forums like Gumtree or Facebook to attract the passive job seeker. Your own company website is also a key tool to be used to advertise jobs and then these can be promoted using social media channels. Check out our blog on using social media for recruiting. Referrals, ask your staff to refer their friends and family members. Encouraging your staff to share out links from your website and social media is also a great, free way to advertise, as is encouraging “word of mouth” sharing. Incentivise them – give them a financial thank you when their friend starts work and perhaps another amount once they’ve stayed 6 months. Or a voucher? These endorsements are a fantastic way to produce “warm” candidates for the vacancy as the employee has already done some of the selling for you and shows that they value their place of work enough to recommend it! Industry job boards are another avenue to attract particularly skilled workers or those with specific experience. If you have the budget, then a specialist recruitment agency is another approach to consider. They can help source permanent, as well as temporary staff. This can be an expensive option where the staff turnover of roles is high, although you would only pay a fee upon successful placement. If it’s a local job for a local company, go local. Advertise in local press, supermarket ad boards, community job boards, shop windows etc. Open days are also a great way to attract local talent. They are intensive but very effective if you get your advertising right. You can see a lot of people in a short space of time and therefore shorten the recruitment process a lot. If the work can be quickly trained and if there is a need for casual workers, universities, colleges etc great place to advertise. Most have own dedicated job boards which are free to advertise on. Consider taking on apprentices to fill the roles. They can be a valuable asset to an organisation, providing you with a trained workforce from scratch. Read our tips on starting an apprenticeship scheme. For more details or to discuss any help that you need with your recruitment challenges, feel free to contact us at support@bespokehr.com.